Every student is able to participate in our walk-a-thon because it is held during the school day. Every child receives an event t-shirt, provided by the Payne H&SC. At designated times throughout the day every student participates in the walk-a-thon with their grade level. They do a warm up, walk the track, and then enjoy a fruit bar to cool down! It's such an awesome day! Parents are also encouraged to come cheer their children on! If you would only like to volunteer on the day of the Panther Prowl, please watch for sign up sheets on classroom doors toward the end of October. Securing Sponsors to help cover the costs of T-Shirts: Going on NOW! Every year, we try and secure sponsors to cover the costs of the t-shirts. This is how every child will get one for FREE! T-Shirt Sizing: October 11th: This day we will have "kick off" assemblies where the kids will learn about the Panther Prowl Walk-a-thon. After each grade level assembly we have a list of students in each classroom and figure out the best size t-shirt them them. We usually need 5 parents per assembly to help with this. Interested in being our mascot, Blue, for an assembly? Let me know! 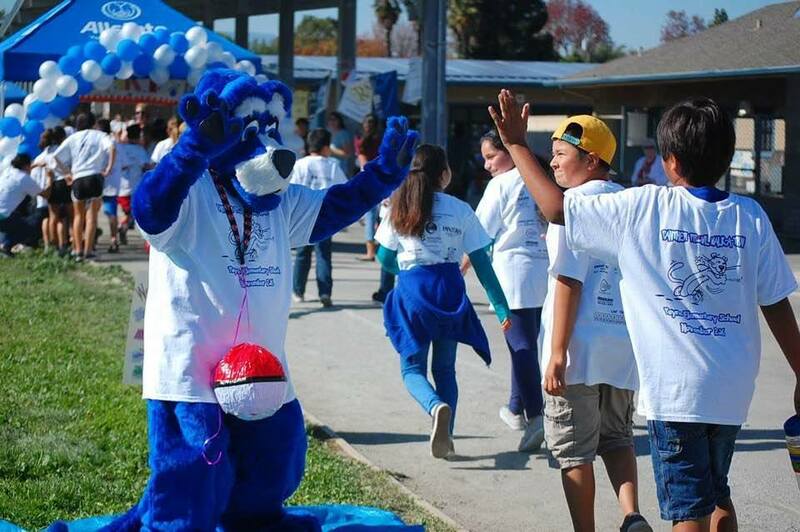 The children LOVE to see our mascot in action, dancing and giving hi-fives! If interested you would just have to show up, put on the costume and dance around for 5 minutes at the start of each assembly. You don't have to stay for each assembly, I will work with your schedule! Last year we were able to get the water & fruit donated by businesses. I would provide you the letter to approach the businesses and you would have to contact them. Also being able to get volunteers to slice fruit the day before. The kids loved this part of the walk-a-thon, eating all the fruit!! Are you creative? Last year our theme was emojis and we had some awesome emjoi art on the field that a Payne parent made. They were amazing! This year's theme is superheroes so we would need different decorations to go around the field. Great artwork gets the students excited and motivated for the Panther Prowl!